I spend my last couple of days in Nicaragua in Rivas followed by San Juan de La Sur. Firstly, my Spanish buddy and myself stopped in Rivas for some souvenir and clothes shopping. I had not been shopping in a long time and wanted to buy some bits and bobs. Turned out that Rivas is not the place for it. Things were expensive and of a bad quality. After looking around some unsuccessful shops we decided to leave with no souvenirs or new belongings and get to somewhere a bit nicer for the night. 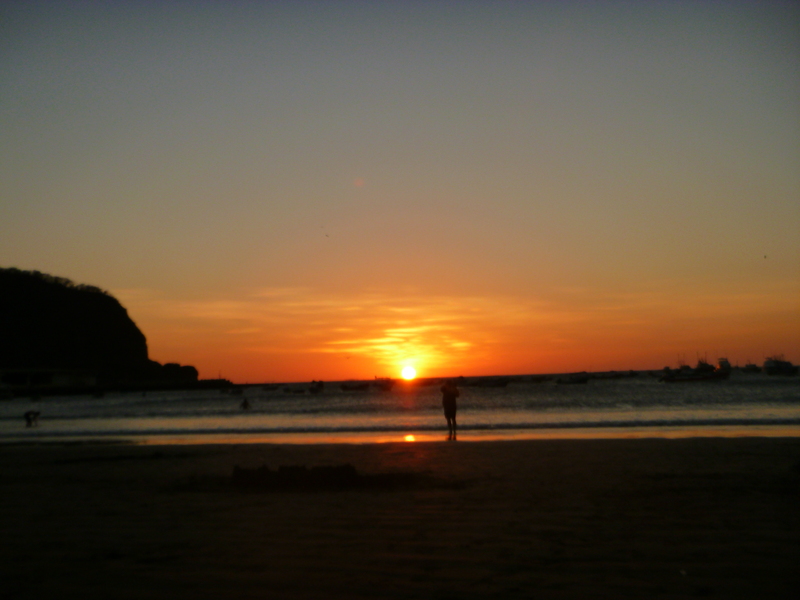 Consequently, we spontaneously took a taxi to San Juan de Sur. This is a touristic, surfer, beach town. 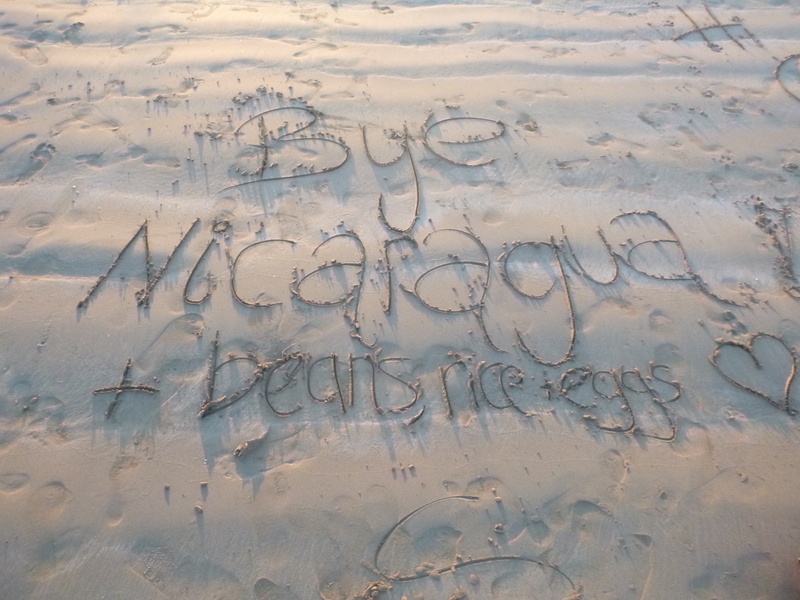 While, neither of us are surfers we fancied a chill somewhere better than Rivas and wanted to leave Nicaragua on a high. We enjoyed a relaxing day on the Merida beach a shirt bus ride away (I sheltered in the shade of a restaurant, read my book and unwound after being on the move the prior day). I watched surfers glide along grand waves for long stretches of time. It is such a skill and balancing act. Others fell flat on their faces into the ocean, while their surf boards flew into the air bouncing of the water surface behind them. The bright blue sea swept inwards, while the strong sun reflected of the right hand section of the sea colouring it white. I ran out onto the beach and into the cool sea, letting the waves hit my legs as I went further out. Finally I submerged my whole body into the cold salt water letting my body temperature decrease slightly. That evening we enjoyed a chocolate covered banana and sat on the sand as the bright orange sun set over San Juan. The sky lit up a stunning pink and cast shadows over the yachts in the sea. Drawing pictures on the sand was nostalgic. I felt carefree and like a child again focusing on the shapes my ice-cream stick drew. Before settling down for sleep, we enjoyed a delicious glass of red wine with an ocean view. Sometimes my favourite parts of the sun set are actually after the sun is no longer visible. When the dark sky still holds colours reflected from the sun. A dusky, grey orange lined the entire horizon with a scale of light black to dark above it. City lights in the distance began to flicker on, providing more shades of shiny or age and yellow. The statue of Christ on the hill top was lit up revealing it’s green figure. San Juan was a lovely place to spend two nights. While it was extremely touristy the sunsets were worth it. 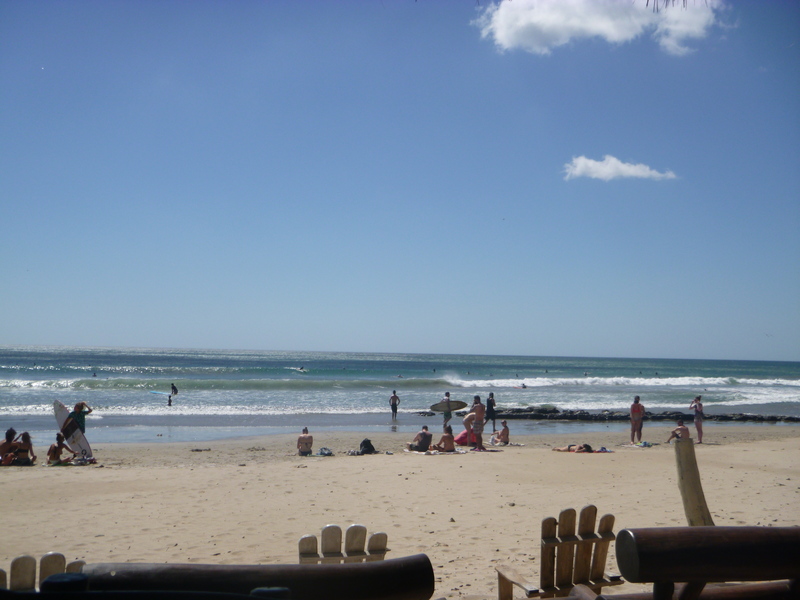 If you need a stop over before heading to Costa Rica why not check out San Juan. Just be aware it is a party, gingo town – we managed to avoid the loud side but any longer and it would have been too much.